With just a week to go before April 17, it's crunch time for getting your taxes filed. If you're just now getting started, the first question you have to answer is which form you should use to file. The simplest IRS tax form is 1040EZ. 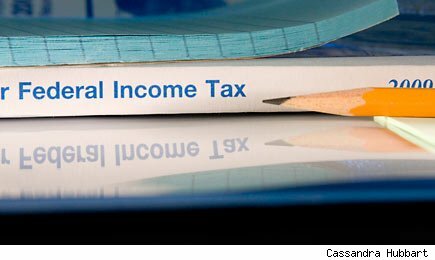 Either single or joint filers can use Form 1040EZ if they don't claim any dependents, have less than $100,000 in taxable income, and don't have any complicated tax issues like income adjustments due to IRAs or household employment taxes. You can claim the Earned Income Credit, but if you have other credits, then this is the wrong form for you. Similarly, you can earn up to $1,500 in interest income, but if you earn more interest than that or have other types of investment income such as dividends, then you can't use Form 1040EZ. You also can't itemize deductions on Form 1040EZ, so if you'd benefit from itemizing, you'll need to use Form 1040. Find out more about whether you can use Form 1040EZ on pages 5 and 6 of this PDF. If Form 1040EZ doesn't work for you, Form 1040A is the middle-ground choice. Easier than a full 1040, Form 1040A lets you include income from dividends, capital gains, pensions, and unemployment compensation, among other sources. On the deduction side, you can write off IRA contributions, student loan interest, tuition and fees, or educator expenses. You still can't earn more than $100,000 in taxable income, but you can claim more credits, including the popular Child and Dependent Care Tax Credit and various education credits. But if you're self-employed, received income from a partnership, or have certain complicated types of income or expenses, then the only way to file correctly is on Form 1040. Get all the details about using Form 1040A on page 11 of this PDF. Even if you have to file on Form 1040, you shouldn't feel intimidated. Most people won't need to fill out anywhere near every line on the 1040. Moreover, by giving you more chances to save, Form 1040 may not only be the best choice for your filing, but it may also get you the biggest refund. That's reason enough to celebrate as time runs out on the 2011-2012 tax season. Before you can even think about filling out tax forms, you need to get organized. Instead of stuffing receipts in a shoebox throughout the year, you can simply take photos of them and store them in an online account using the "Shoeboxed" app. Once receipts are downloaded, they are sorted by date and archived into spending categories like meals, travel, fuel and office supplies. You can then search for specific expenses and add them all up when claiming deductions at tax time. You can upload and store an unlimited number of receipts in a free account by snapping photos of them. But in order to organize your spending by category and calculate total expenses, you need to transfer the key data from your receipts -- like the vendor name, items purchased and total cost -- into your account. With the free version, Shoeboxed will transfer this information for you automatically for the first five receipts. For any receipts beyond that, you either have to manually enter the data or pay a monthly fee starting at $9.95 if you want Shoeboxed to continue uploading your data automatically. When you finally have everything organized, you can file your taxes straight to the IRS without going to a preparer or even using a computer. Just take a photo of your W-2 with your smartphone, and your data will be uploaded into the application. You then simply review the form, enter some basic information about yourself and you're ready to e-file. The app is designed for simple returns involving a 1040EZ form, so it's perfect if you're single with income of less than $80,000 or married with a combined income of less than $100,000. But the app won't work if you have a more complicated return -- meaning your income exceeds these amounts, you have dependents or you own real estate, for example. The app, which launched in January, is available for iPhones and Androids and is free to use through April 17. The company will begin charging a filing fee after the April 17 deadline. TurboTax has a similar app that lets you file your taxes by taking a photo with your phone, but it costs $24.99. When it comes time to write off charitable donations on your tax return, you can't just guess. If the IRS comes knocking, you'll need proof that you donated your old couch to the Salvation Army and what it was worth. iDonatedIt, an iPhone app created by a group of certified public accountants, helps you keep track of the items you've given to different charities, and even estimates the value of those items based on their condition and other factors. It also lets you snap photos to store for your records. As you continue to make donations, the app calculates the estimated tax savings you will receive. You can e-mail the donation reports to yourself or straight to your accountant when it's time to file your taxes. The app costs $2.99 for unlimited use and is available on iPhones and Androids. Need a little motivation to get your taxes done? This app will quickly estimate whether you're owed a refund this year and how fat the check might be. Just enter some basic information, including your income and deductions, and the app will calculate your refund -- or the taxes you might owe. You can even plug in different scenarios, like accepting a new job or buying a house, to see how it would change your refund amount or tax liability in the upcoming tax year. The TurboTax app is free to use and can be downloaded on iPhones and Androids. Considering that we dole out an average of 29% of our income in taxes to Uncle Sam, you don't want to miss out on a single credit -- especially one that could result in a lucrative payout. The Earned Income Tax Credit, which gives up to $5,700 to workers earning income under $49,000, is one of the most commonly overlooked credits. The IRS estimates that one in five qualified taxpayers overlook this credit, even though it could put a lot of extra money their pockets. To help more taxpayers take advantage of this credit, tax software developer Intuit has created a free app for iPhones and Android smartphones that allows you to enter basic information about your tax situation -- like your income, filing status and number of dependents -- to determine whether you qualify for the credit. If you're eligible, the app calculates just how much money the EITC will bring you. Continue this gallery to read about three more tax apps on CNNMoney here. Quiz: Are you smarter than the IRS? Motley Fool contributor Dan Caplinger is fortunate enough to have gotten his taxes done a little early this year. You can follow him on Twitter here.